ESET Cyber Security Pro represents a new approach to truly integrated computer security. 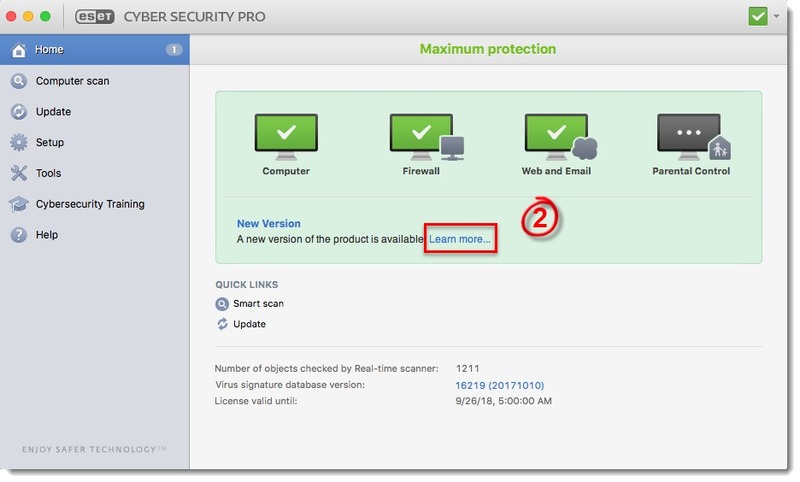 The most recent version of the ThreatSense scanning engine, combined with Email client protection, Personal firewall and Parental control, utilizes speed and precision to keep your computer safe. The result is an intelligent system that is constantly on alert defending your computer against attacks and malicious software. ESET Cyber Security Pro is a complete security solution produced from our long-term effort to combine maximum protection and a minimal system footprint. Based on artificial intelligence, the advanced technologies that comprise ESET Cyber Security Pro are capable of proactively eliminating infiltration by viruses, worms, trojan horses, spyware, adware,rootkits and other Internet-borne attacks without hindering system performance. ESET Cyber Security products focus on effective detection of yet unknown malware by utilizing advanced Heuristics, generic signatures and genetic technology and are engineered with low memory usage and minimal notifications to protect Macs while keeping them running at peak performance. Ultimate protection is strengthened by ESET’s cloud-based reputation system called ESET LiveGrid.